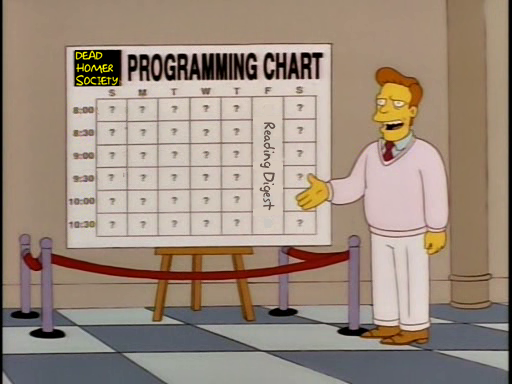 With Season 23 now rapidly fading into the indistinct blob that is Zombie Simpsons, it’s time for us to get started on our summer schedule. As you can see from the chart below, there are some blank spots on it. We will be doing Crazy Noises for Season 11, and the first of those should be along later this week. I’m also going to do some more commentary posts from earlier seasons. But even that will leave lots of days around here that can only be filled by exploiting other people’s time and labor. So, just like last summer, we’re going to pass the days by not paying other people to write blog posts for us. Last year we had a bunch of great entries (check out out Company Eating Rules category), including several lists, personal essays, and analyses of different show eras. If you’ve got a blog or other website, we’ll not only link to it, but you can cross post your article there as well. Pictures and images are welcome, and just about any topic that’s Simpsons related is okay by us. As a special incentive for anyone in the Washington D.C. area, we’re giving away free tickets to “Mr. Burns, A Post Electric Play”. Thanks to my relentless linking to their blog the last few weeks, the theater’s social media person got in contact with us last Friday. Neither Dave, Mad Jon, nor myself are in D.C. or are going to be there before the play closes, but rather than turn down free stuff, we thought it better to give the tickets to the first person who offers to see it and write a review for us. So if you can make it down to the Woolly Mammoth theater in the next couple of weeks, and you’ve got a 500-1500 word review in you, e-mail me and we’ll talk. Anyone else who wants to write a guest post for us should e-mail me as well, though your only compensation will be the enjoyable pride of a job well done. That’s not as cool as free tickets, but we have always depended on the kindness of strangers.